I received an email yesterday telling me it was OK to set up my phone account now, so I tried and it wasn’t and when I phoned they said sorry and had no idea why but they’d fix it and gave me another five Euros credit. With that, I phoned the supplier of our steering bits in the UK, to discover they hadn’t received some vital parts yet and it definitely won’t be this week that they arrive. 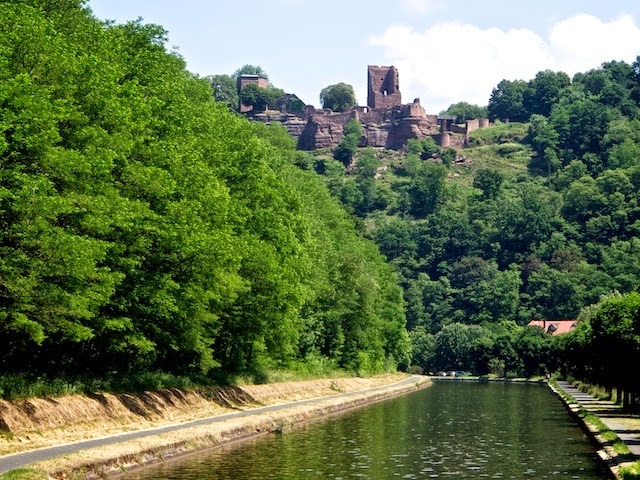 So we decided that while we like Lutzelbourg a lot, and we were quite close to Saverne, we had enough time up our sleeve to perhaps head towards Saarbrucken for a few days in Germany while we wait for the errant parts to arrive. For a moment or two we thought about just heading off for the whole summer without them, but that was the exact moment that Mr Perkins decided to voice some sort of disapproval by continually adjusting his own speed. This was a little perturbing at first, as smart technology was not a concept that existed at the time of his manufacture, and it quickly became quite perturbing when I checked his cave. There I found him, perhaps to spite me for cutting off his new found oil supply, wallowing in diesel. I can’t be sure, but I suspect that some of his grumpiness at low revs may not have been due to all those new parts getting used to one another as I thought, and may have been everything to do with the injector lines being almost, but not quite tight. Having tightened them a bit, with fingers crossed, and plucked two toilet rolls full of diesel from the catch tray, we are hoping the problem will go away but somehow we are not convinced that such a small weep could be the cause of such a large amount of fuel escaping. So now we have a new plan. Tomorrow we might try to limp home lest we be stranded in the wilds of rural France, amid all those cows and cheese factories and cottages selling wine and honey. It is natural to be a little disappointed when things like this happen and it’s even tempting to become a bit dispirited, but really, who will give sympathy to a couple who spend half their lives idling around France on a boat? When our plans come tumbling down, no one stops to take photographs. It’s not like we are an old Chateau or something.